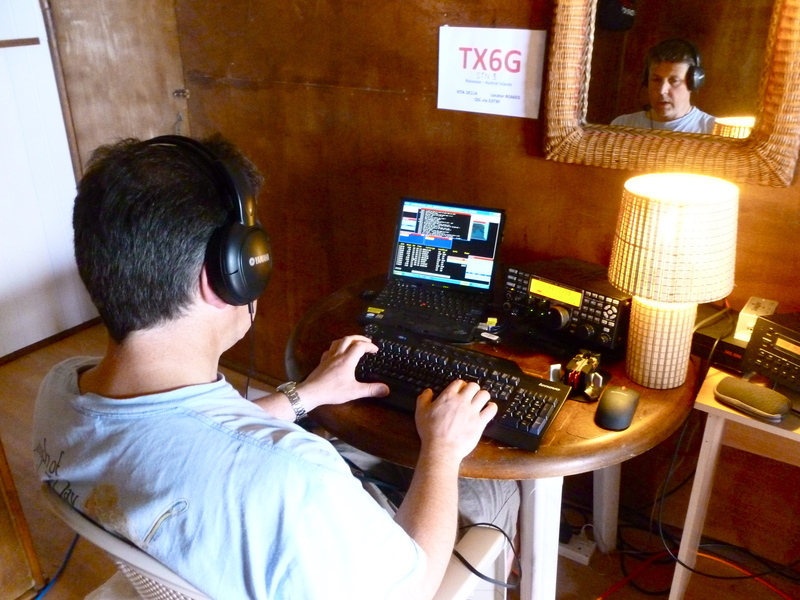 The TX6G team plan to have up to three stations operating round the clock, depending on band conditions. Modes will be CW, SSB and RTTY. Bands are 160 through 10m (but not 60m). The antenna for 160/80m will be shared so we cannot be on both bands at the same time. It is likely that we will alternate the two bands on a daily basis – watch our blog posts. We are not publishing operating frequencies in advance as we know there will be other expeditions active as the same time and we aim to steer clear of them. Watch the Cluster for spots. We are aware of the various international frequency allocations and will aim to be available to all countries and to all classes of licensee at some stage of the expedition. In general, expect us to operate split frequency, probably around 1kHz up on CW and RTTY and 5kHz up on SSB. Please NEVER call on our transmit frequency. We will announce our listening frequency regularly. We will ask the rest of the world to stand by when “edge” openings are available. Thank you for your understanding. Other than these “edge” openings, we will not be working by numbers or call areas and we will not be participating in net operations.